Wow, are you fans ready for another season? I know I am. It is going to be hard to top last season, as we had the Heisman Trophy winner, won the Pac 12, and went to our first annual College Football Playoff Championship. The only way the season could have been better was if we had gone undefeated and won a National Championship. But no matter how good a team is, it’s unreasonable to assume it will go undefeated. Despite that, I do believe we have a very talented team this year with a lot of potential. We have the pleasure of having the problem of too many running backs and a transfer that you have to have been living under a rock to not have heard about by now. 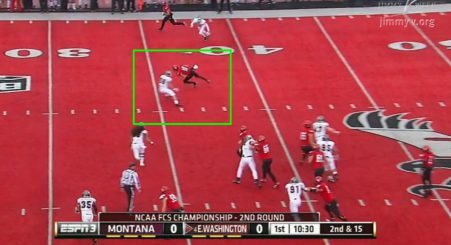 Let’s not get ahead of ourselves though and look too far into the future, because this Saturday we have an opponent who took Washington to the edge and beat Oregon State in 2013 and 2014. 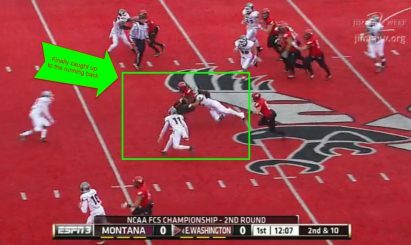 Everyone knows that Oregon is starting new transfer quarterback Vernon Adams from Eastern Washington, the same Eastern Washington we are pitted against in two days. When was the last time this happened? This is going to make for an interesting debut. Now, let’s analyze our first opponent. 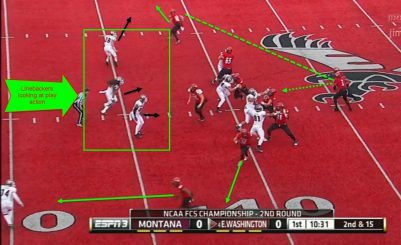 Despite the loss of Adams at quarterback, the Eagles have a plethora of receivers — their top three receivers are returning, including Cooper Kupp, who is widely regarded as the best receiver in the FCS. They also have a stable of running backs led by two juniors, Jalen Moore and Jabari Wilson. Jordan West is Adams’ successor. Some may think the only playing time he has had was in late game blowouts. This isn’t true though. Adams broke his foot and was out for four games when West led the team to a 3-1 record with 1,010 yards, eight touchdowns and only one interception. That’s pretty remarkable for a backup. Out of the pistol, the Eagles can run or pass. The Eagles run a spread offense out of the gun or the pistol. They have a balanced spread offense and are a mix of Washington State and UCLA. It’s a very interesting offense that is clearly very effective, 44.1 PPG and 513.4 YPG last year. Let’s look at a staple run out of the pistol. 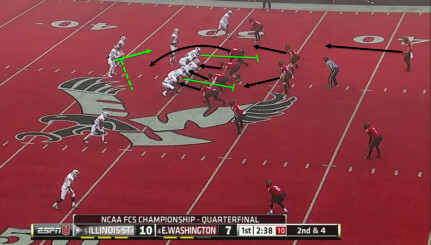 As you can see above, the Eagles are lined up in the pistol with four receivers with the defense lined up in a 3-3-5. There’s a huge hole for the running back to run through thanks to some superb blocking. Right before the snap, the right outside linebacker is going to walk up to the line, playing right into the Eagles’ hands. 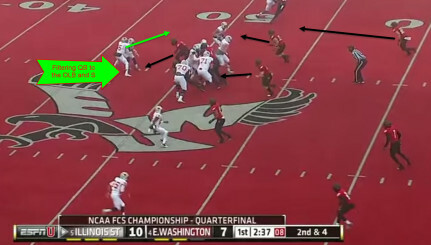 Seeing this, Vernon Adams and the offense knows this play will work. Once the ball is snapped, the left tackle blocks the right end out (the man in front of him) and the left guard blocks the right outside linebacker in to create a hole for the running back between them. The rest of the line just blocks whom they can while trying to keep the defense from filling the hole and engaging the running back. The running back is able to make a great gain of nine yards. The running back gets the ball from Adams and sees the hole, cuts back and hits the hole hard. The receivers do their job blocking the defensive backs, and it is not until five or six yards past the line of scrimmage that the middle linebacker is able to get ahold of the running back. The play results in a gain of nine on a second and ten. This is just a simple dive play, but it’s the execution and what the offense does in the following plays that makes it so effective. Out of a very similar formation as the previous play, the Eagles pass. This next play occurs just two plays after the dive play we just talked about. 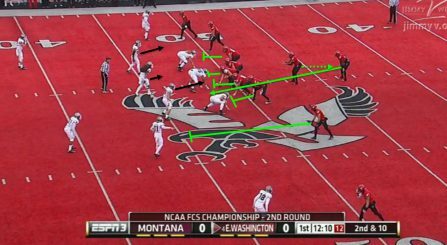 As you may be able to guess, or can see in the screenshot above, Eastern Washington is lined up in a pistol formation again, with three receivers and a tight end. The defense is lined up in a 4-3. Selling the play-action forces the linebackers to hesitate. At the snap, the Eagles sell the run from the play above beautifully, and since the defense was just beaten on that play, it reacts to seeing it again and hesitates. The linebackers freeze, not sure whether to go after the running back or the potential pass. The offensive line sells the run too, almost too well though. As you can see in the screenshot above, the center almost crosses that three-yard mark that is the illegal-man-downfield threshold. The two outside receivers run deep routes to clear the flats for the tight end and the slot receiver. This may not show the biggest gain in the world, but it demonstrates an easy throw and a staple of the Eagles’ offense. The two outside linebackers are slow getting to the slot receiver Cooper Kupp and the tight end since the run was sold so well. 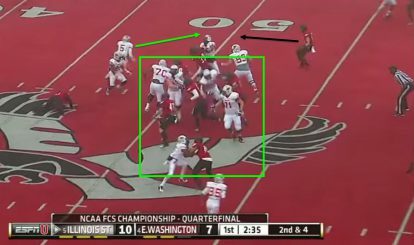 This gives Adams plenty of time and space to find his first progression read, Kupp, for a clean six-yard gain. 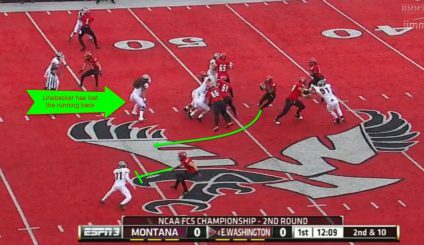 If you look at the bottom of the screenshot, you can see the tight end who is even more open than Kupp, but since Kupp is the first read and is open, Adams throws it there. Either way, it’s a solid gain on second and fifteen and a very effective play when paired together with the dive play from above. 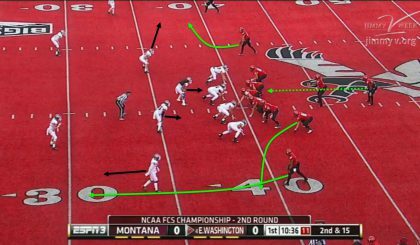 While Eastern Washington’s offense appears formidable, the Eagles’ defense is questionable. It gave up 31.4 PPG and 441.8 YPG last year. Luckily, because of the offense, the Eagles were able to do enough to make last season a successful one. This led to a firing of the defensive coordinator. The new coordinator is looking to implement a 4-2-5 defense, relying on their experience in the defensive line to help the young and inexperienced secondary. The defense is returning six starters, but only one of those six was in the top four in total tackles last year. Despite that, as I said, their offense is explosive, so all they need to do is get a few stops against the Ducks, who are trying to get their feet under them with a new quarterback and offensive line. Oregon will be a huge first test for the Eagles’ defense. With the Eagles’ defense changing, it is hard to determine how they may try to stop the read option, but they’ve been running a 4-3 with one of the linebackers playing almost like a defensive back — so it’s similar to what they’re going to do. As you can see above, the Eagles are lined up in a 4-3 with the left outside linebacker shading toward the slot receiver. The linebackers fill the holes to force the quarterback outside. At the snap, the right defensive end, who is the read man, is going to go straight for the running back, while the rest of the defensive line is going to just try their best to close up any holes and occupy as many blockers as possible. The linebackers are also going to fill the holes, forcing the quarterback to jump outside the tackles. The quarterback is forced outside into the awaiting arms of the safety. This plays right into the Eagles’ hands as the safety is coming up from twelve yards out to make the tackle at the line of scrimmage. Unfortunately, the safety misses the tackle, but the linebacker is there to clean it up, stopping the offense for a two-yard gain. One thing that can’t happen if the Eagles are going to have any chance: They can’t allow teams to score 89% of the time once they get in the red zone. That just can’t happen. This could be a good game if the Eagles can continue their offensive success they’ve had against Pac 12 teams in the past and can get some defensive stops and turnovers. The Ducks can’t take this game too lightly. Look for the Ducks to get settled in with the new offensive personnel by running the ball with the multitude of running backs. Then as we get deeper into the game, Adams should start to air it out against the inexperienced Eagles’ secondary. I’m going to go with a score of 38-20 and a much-needed victory before next week’s colossal matchup against the Spartans in East Lansing. Man, am I happy college football is back!